Level 4: Grades 7 and 8 "THE OWLS"
​During these years of intellectual and personal transition, students need structure and support as well as increased academic challenge and independence. We have structured our Level 4 program accordingly. For the two years students are in this level they find many opportunities to explore emerging interests, to gain experience in leadership roles and to develop the skills critical to later academic success. As at other levels, our curriculum focuses on thematic projects. Although students at Level 4 read independently, they must continue to cultivate reading skills, but at an advanced level. Our reading program requires each student to read at least three novels, as well as several short stories, poems and plays per year. We work with each student to develop an individualized plan that improves and enhances her/his language abilities. Reading instruction at Level 4 is designed to help students build vocabulary, connect fiction to multiple areas of study, and explore other times and places. Students leave the classroom able to name their favorite genre, author and novel. By Level 4, students should be able to write multiparagraph essays with accurate spelling and punctuation. Throughout the school year, students practice writing by composing several essays and extensive journal entries. Two hours per week, we practice specific writing skills and participate in a Writer’s Workshop. Students create writing portfolios and are consistently asked to write, edit and revise their work. Teachers meet with small groups each week to provide feedback and to keep them working to their highest potential. Students practice speaking and understanding the spoken word. They craft individual presentations in addition to developing practical speaking skills that are used when addressing peers, special guests and teachers. We also help students to decode the subtle and often hidden meanings in everyday speech. Students participate in whole class, small group and partner discussions. Good listening skills are essential to all aspects of our lives, and the Level 4 classroom is no different. We expect students to listen and to interpret various types of information throughout the school day. They learn new strategies for identifying important details and unpack words or phrases they do not understand. We check student comprehension through writing and discussion. Level 4 requires students to use critical thinking and evaluation skills to analyze specific events throughout history. Reaching beyond the memorization of dates and names, students must react to various perspectives and learn to recognize accuracy of the information. Additionally, we focus on current events and social phenomena, tying history to students' lives. Recognizing connections between history and current events allows students to see cause and effect in action. Over the course of two years, students learn American history from the end of the Revolutionary War to 1960, the American political system, world geography, ancient civilizations, an introduction to economics, and pertinent events in world history. Social studies reaches beyond historical understanding, and we discuss many difficult topics, allowing students to develop their own ideas about the world around them. Topics include: racial inequality, social inequality, and social interaction with their peers. Civil War Re-enactment – Students learn about the Civil War in class and then try on antebellum period clothing, “fire” a cannon and handle medical equipment available on the battle field. 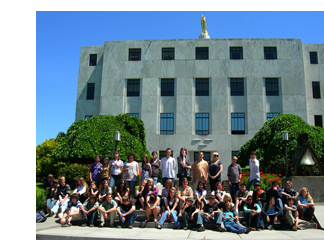 Project Citizen – Together, we learn about the American political system, identify a public policy problem, create an action plan to solve it and then present our work in Salem to a mock Congressional Hearing. Medieval Armor – Working with local medievalists and faculty at Pacific University, we interact with actual tools, clothing and armor used during the Middle Ages. ​Holocaust Resource Center – Pacific University’s Holocaust Resource Center provides a wonderful resource center dedicated to educating students about the Holocaust. We work closely with the Center to better understand this horrific period of history. Instruction at this level continues to build on the foundation laid by prior levels, continuing to find common ground between real-world situations and mathematics. Particularly at this level, it is important for math to be meaningfully applicable to students’ lives. While this is not always possible, we do make every effort to marshall numbers from daily life and represent them in personally meaningful, mathematically rigorous ways. Students are given the opportunity to use mathematical concepts and skills within everyday situations and in other subject areas: Geography, Social Studies, Art, and especially Science. Over the course of two years, Level 4 mathematics gives students a solid foundation of basic arithmetic and prealgebra so that by the end of the second year, they are ready for algebra. Students learn individually, within groups, and through problem solving as a class, with active participation expected of all. For group learning, students are pre-assessed at the beginning of each unit and are placed accordingly. These groupings are fluid, changing as needed, to accommodate students’ mathematical development. Students who are ready have the opportunity to study Algebra in the 8th grade. 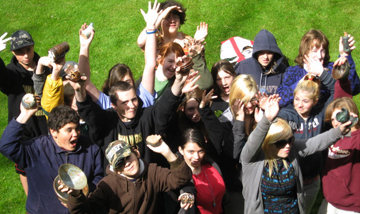 During the 2011-12 school year, this class is offered before school to students who are ready for the work and can commit to a before-school class. Algebra students have a work period to complete class assignments, assessments and homework during the first period of the day. Students in Level 4 use community projects and problems as opportunities for problem-solving, observation and mathematical analysis. Through discussions, research and experimentation, students monitor, record and make conclusions. In short, they engage in the discovery of science. Level 4 science covers Earth science during one year; Life science and Physical science during the next. Earth science covers areas such as: rocks & minerals, soil, weathering & erosion, tectonics, resources & stewardship, and weather & climate. Following Earth science, Life science covers areas such as: cell theory, taxonomy, bacteria, viruses, invertebrates, vertebrates, and ecology. Physical science covers areas such as atomic theory, motion, states of matter, astronomy, and energy. 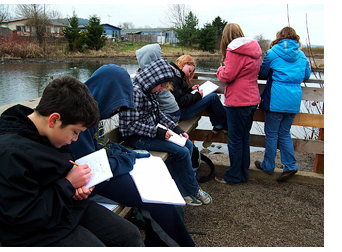 In 2011-12, Level 4 students will participate in a series of Field Seminars related to science studies. Field Seminars - some scheduled during the school work and some on the weekend to allow for more in-depth studies and family involvement - will focus on astronomy with a star-gazing night at Stub Stewart State Park and on geology (rocks, minerals, erosion, topography) with seminars at Ape Caves/Mt. St. Helens lava canyon, the gem and mineral show, Vernonia Rock Outcrop, and Saddle Mountain in the Coast Range. Art is an integrated subject at FGCS, and each art project is designed to complement the place-based curriculum of the primary class. This allows each art project to draw from the rich historical, cultural, social and political context being explored within the classes. Through this integrated approach, students are intrinsically motivated to explore artistic genres and experiment with various media and skills, because their creations have immediate relevance to their studies, families, community and world. Level 4 students have two art classes each week for one semester and once each week for another semester during the school year. Students at this level have more autonomy and are given greater choice in what they express and in the materials, tools and techniques used. In a previous year, an integrated art project involved design of the school play yard. Level 4 students worked with architects, designers and staff to develop plans for the space. Art integration led to the creation of mosaic stones that pave the entry to the play yard heralding to all who enter that they are coming into a space of joy and creativity. We take a comprehensive view of physical activity (PA) at the school, planning our schedules and program with an eye to promoting the habits of physical activity in all students. Physical education, breaks, and Out & Abouts are components of our PA program. Students in Level 4 have PE once a week for 60 minutes. Our program is designed to provide movement experiences through which students develop motor skills as well the characteristics of teamwork and sportsmanship. Through cooperative and competitive games, students learn how to use their bodies for a specific purpose. Level 4 students are physical throughout the day and week. With 30 minutes of daily break time on the playground and weekly Out and Abouts - which almost always involve significant walking - we model and promote activity in students.